A few weeks ago, Zachary, one of the co-workers at I Have a Notion asked for some help with his homework. He requested that we print out a Flat Stanley and take him on an adventure and then let him know about it. 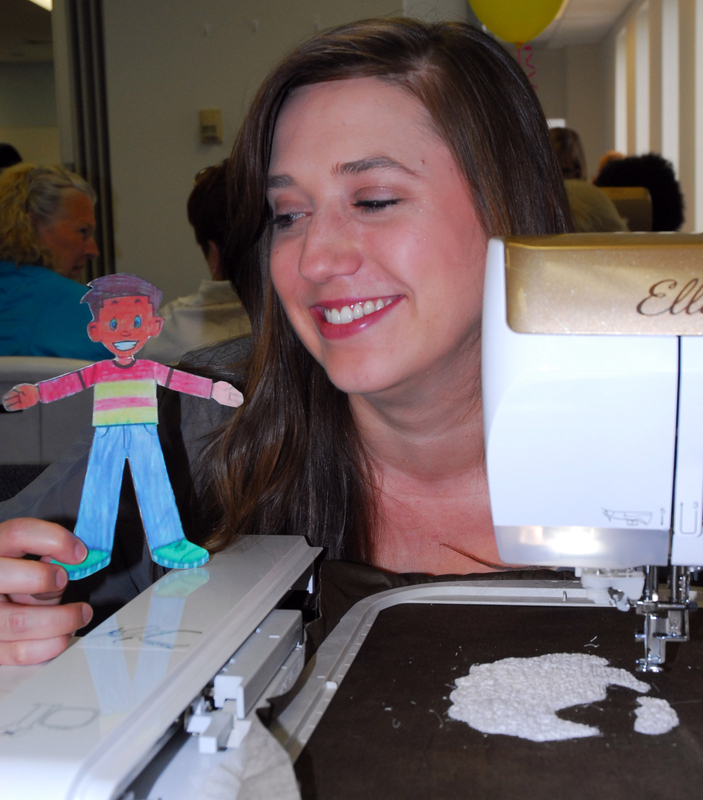 I decided that since Zachary’s mom likes machine embroidery I would take Stanley to the Anita Goodesign seminar I went to in Cleveland, Ohio. I hope I’m not too late in posting this Zach. Almost 2 weeks ago I travelled to Ohio (I live near Rochester, NY) to meet Agnes and the gang of the Dachsies With Moxie (more about that in another post). 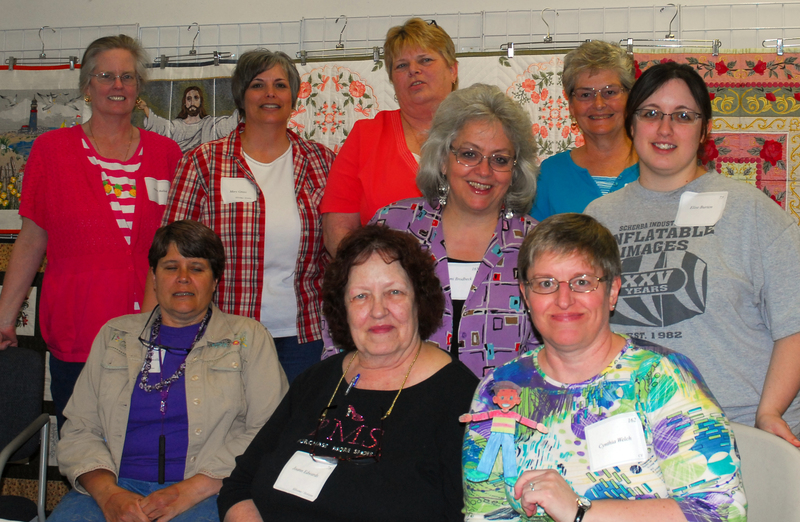 Besides getting to meet Agnes and her gang, I was also there to attend a two-day seminar presented by Anita Goodesign, a company that creates machine embroidery designs. 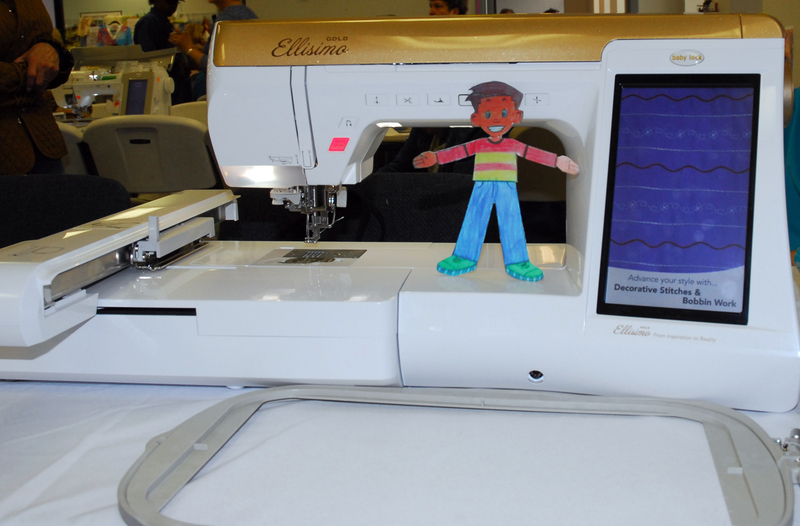 I thought it would be fun to let Flat Stanley learn how to do machine embroidery and decided I would take him to the second day of the seminar. 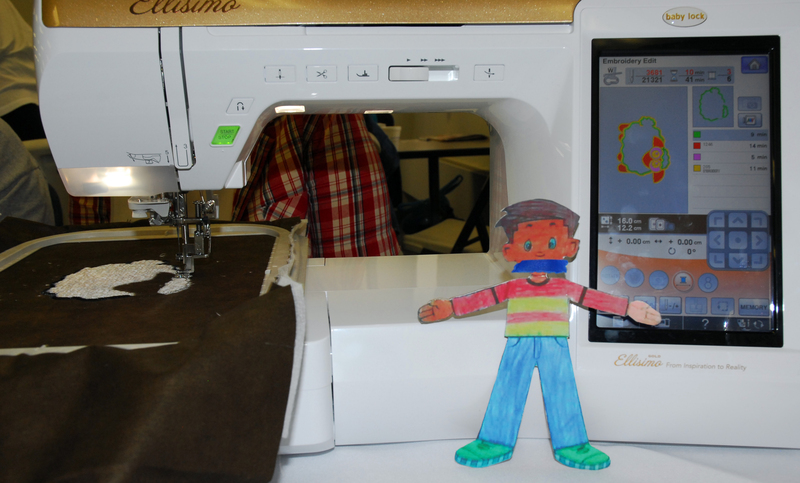 The first thing Stanley wanted to do was learn all about the sewing machine we were using. We had a Baby Lock Ellisimo Gold and Stanley was fascinated by all the decorative stitches it could do. 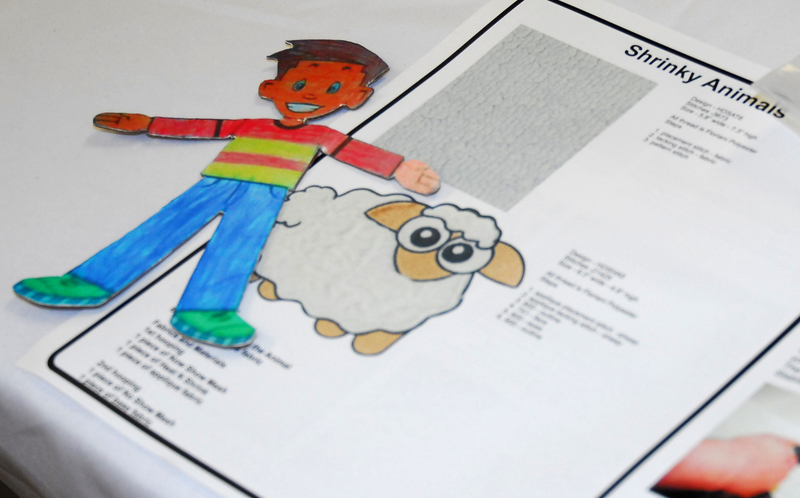 The embroidery we were going to do was this cute “Shrinky” lamb. It is called a shrinky because you use a special type of stabilizer that you stitch on in a certain pattern and then when you put an iron on it the stabilizer will shrink up and make the fabric all bumpy. The white fabric is in the proper position in the embroidery hoop. Now all Stanley had to do was press the start button and hop off the hoop. 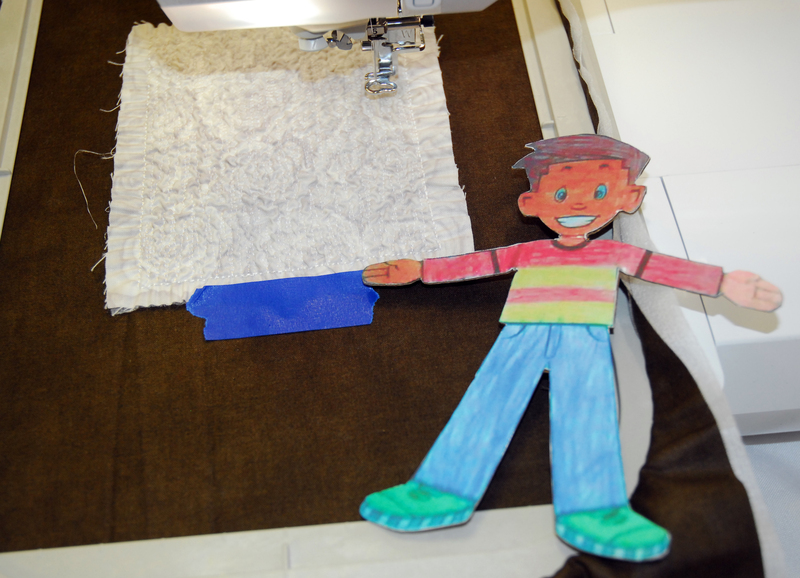 After the fabric for the lamb was stitched and shrunk Stanley helped to secure it to the background fabric. After some more stitching someone had to cut around the shape of the sheep before the next step. Oh No!!!! Stanley how did you get under there? You better get out of there fast before we are ready for the next step! Stanley was rescued by the lovely Holly, our presenter from Anita Goodesign. I think Holly was smitten with Stanley and very impressed with the work he was doing so far. After meeting Holly, Stanley would not stop talking about her and a few of the ladies at our table had enough. Once he calmed down we removed the tape and Stanley behaved himself after that. During the seminar all the machines we were using were for sale. To show that the machine was sold a balloon was tied to it and the machine we were using was sold on the second day. Stanley thought it would be fun to go for a balloon ride. He started lifting off the ground so we had to rescue him quick. After all that excitement Stanley was starving and decided to have a snack. Those peanut butter M & M’s that Agnes brought with her really hit the spot. Stanley had fun meeting everyone at the seminar and insisted on getting his picture taken with everyone that was at our table. That is me with Stanley in the lower right of the picture and Agnes in the upper left. Some of the other ladies at our table came as small groups and two of them came by themselves, but by the end of the two days we were all new friends. Agnes discovered during the two days that she had a connection with a few of the ladies at our table and I am sure she will be keeping in touch with them. All in all it was a very fun, exhausting, and exhilarating two days. A special thanks to Agnes for inviting me to join her at this fun event. Also thanks to Pins & Needles for hosting this event and thanks to Stanley and all the ladies at our table for such a fun time! Wow what a wonderful adventure that was! What a fun time y’all had! 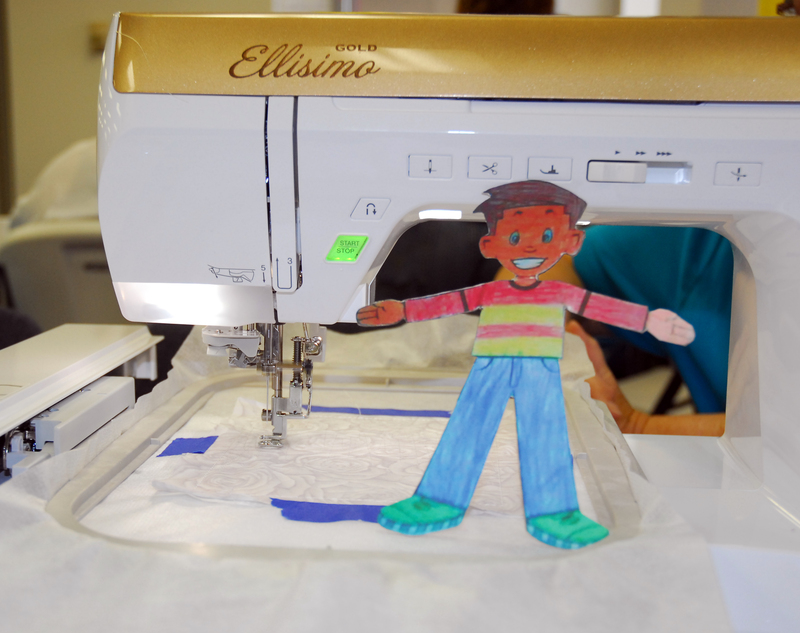 Sure looks like a great time was had by one and all including Flat Stanley! Flat Stanley came to visit us in Florida a few years ago and had a great time playing golf, swimming, looking for alligators, etc. We just got back into town and have been busy around here. Mommy hopes to get a post in real soon. Oh what fun I haven’t seen Flat Stanley in years but I’m so glad to read there are some schools still participating. By the time FS gets home he will have some stories to tell and he might even be able to quilt!! Mom participated in a Flat Stanley marathon many years ago. She took FS all over North Carolina State University and he was a true Wolf Pack fan when he moved on. I can NOT believe that you DUCK Taped Flat Stanley’s mouth!! What a grrrreat learning time. We Love Miss Agnes in our house!!! 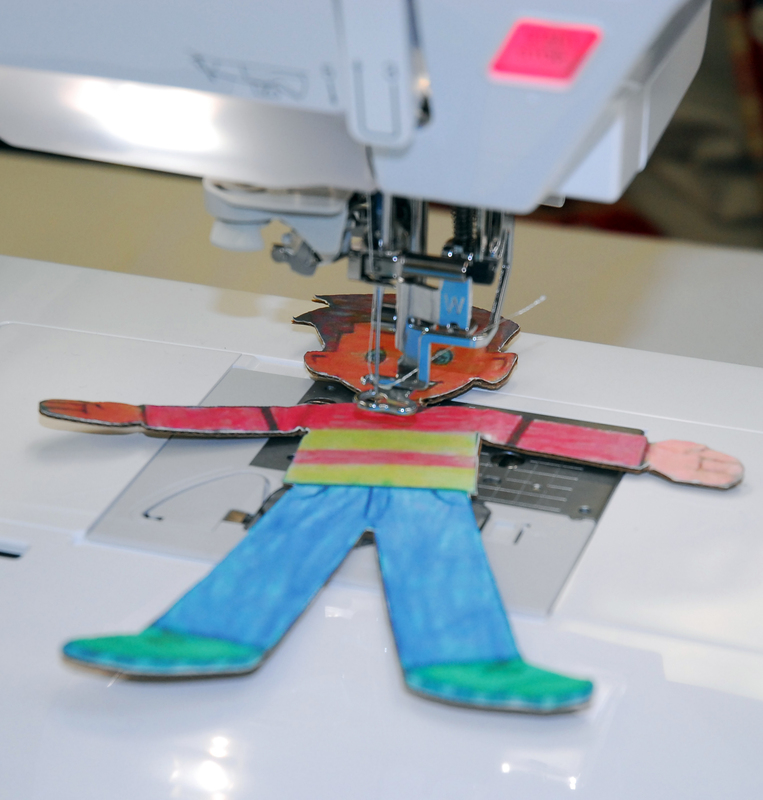 You won’t believe this one….but Zach has been my best helper when doing machine embroidery. This was perfect for him!!! I copied and printed your entire post and included it in his presentation. I know others will wonder what is going on…but Zach knows what you are talking about! That is so cool that Zach likes to help you with the embroidery. As I was writing it I thought about the fact that even some adults that read my blog wouldn’t know what stabilizer is as well as some other terms I used. Maybe some day Zach can “meet” Anita Goodesign too especially since the founder is a guy. That seminar really was a lot of fun. 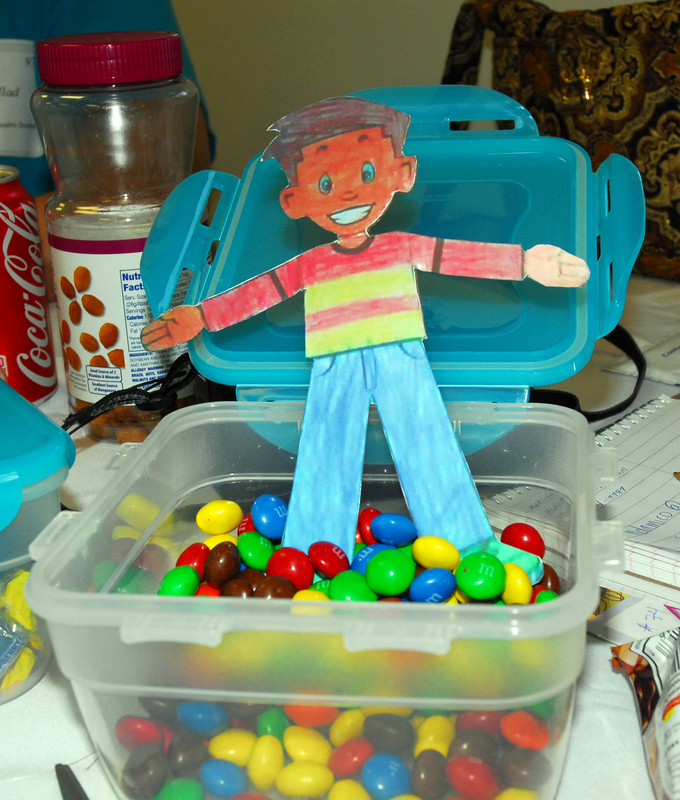 BTW I hope he gets an A.
Gosh is that the same flat stanley that visited Sandy in Ohio? Sounds like you and Stanley had a lot of fun!